A rural evening scene from near to Annan in SW Scotland on Thursday, juxtaposing industry and agriculture. 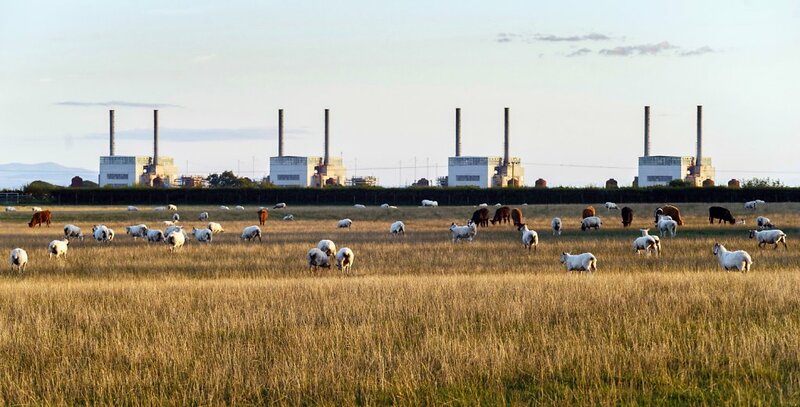 The grazing animals brought to my mind African savanna, and the part decommissioned Chapelcross nuclear power station, Chernobyl. Much of the outer infrastructure surrounding the fast breeder nuclear reactors at Chapelcross remains after the toppling of four large concrete cooling towers about ten years ago. The hills to the left are down in the English Lake District, and the masts on the horizon in the Solway Firth.